One of my favorite online shops for home decor is World Market. Last year I purchased all our baskets for our linen closet organization from there and picked up some great accent pieces too. Two summers ago, I snatched so really cool rope lights for our patio as well as some fun lanterns for around the patio table. 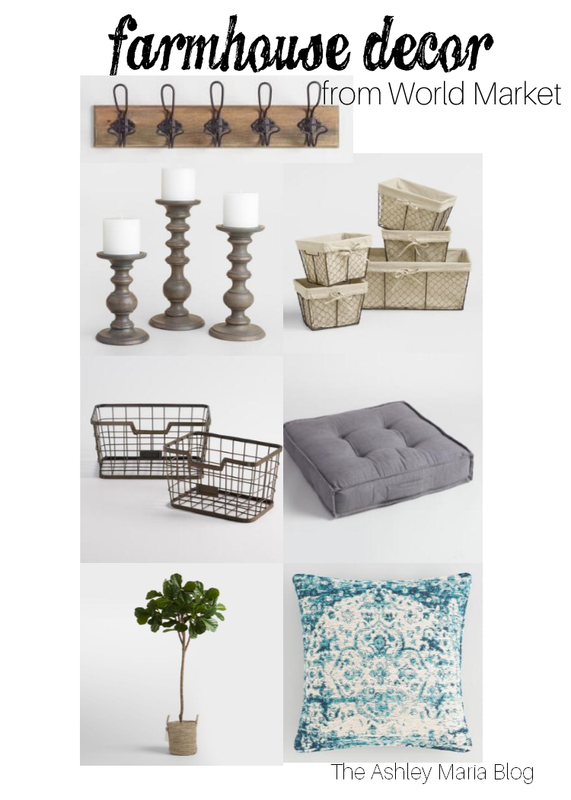 Today I'm showing you some of my favorite farmhouse decor for around your home. Now that I look at the items I picked, it looks straight out of my living room! I love to hang decorative items on my wall rack behind my door, but yet still use it as functional for coats, umbrellas, bags to throw some of Joey's toys when we head out the door. I have similar candle holders on our catch all table as a similar fiddle leaf tree in the corner of our living room. I have black thumb and can't keep anything alive, so faux greenery is the way to go for me! With Joey on the move these last few months, we had to free up some room in the living room. We decided to put our leather reclining chair in the basement in order to push our ottoman against the wall making the middle of the room open. I purchased these floor cushions to use as additional seating and also to help out our butts while we play on the floor with Joey! The ones from World Market are much cheaper, but we really wanted ours to match our sectional! The lined wire baskets are used all throughout my house! I have one in the kitchen that holds our cookbooks to make our shelving a little more tidy. I also have them used in our upstairs bathroom, bedrooms for additional storage and a large one holds Charger's toys . I just love that they go with everything and the liner hides the stuff inside them. The pillows above add a pop of color to a somewhat plain and neutral decor scheme! What do you think? Are you a follower of the farmhouse/ neutral trend?